Large boat storage proposal in Marina del Rey meets with strong public opposition. 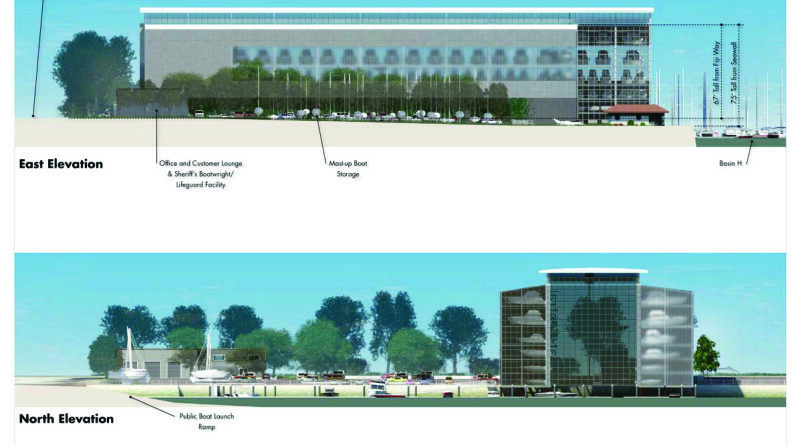 Boat Central project does not moves forward to Design Control Board. Dry boat storage project has been in planning process since 1999. Boaters fear Boat Central would result in increased costs and decreased boating participation. Small Craft Harbor Commission said intent of Boat Central is to keep boating costs low and increase number of boaters in Marina del Rey. MARINA DEL REY — A planned boat storage structure in Marina del Rey once might have only been found in Hollywood. Back in 2004 the film “I, Robot” featured an automated crane retrieving a vehicle from its parking spot inside a multistory storage area and delivered it to where Will Smith’s character stood waiting for his car. An automated multistory parking garage was also featured in 2011’s “Mission: Impossible – Ghost Protocol.” However boaters in Marina del Rey aren’t buying a similar concept for boats to be built in Marina del Rey. Plans for an automated boat storage building – with more than 90 feet of structure hanging over water – remained in purgatory after the Small Craft Harbor Commission failed to approved a lease option agreement for the Boat Central project. A motion to approve the lease option agreement was not approved. Only 2 of the 3 commissioners present at the Sept. 21 meeting voted in favor of the lease agreement; all three commissioners needed to support the motion. Boat Central has been on the county’s docket since the turn of the century. Plans call for an automated boat storage structure, complete with automated cranes capable of lifting boats out of the water and placing them into a dry slip above water. The commission’s action was strictly limited to approving a lease option agreement for rights to the land. The goal of Boat Central, according to commissioners, was to have a venue for small boat owners to store their respective vessels without having to worry about the costs or hassles associated with a wet slip. County staff said building a multi-story dry storage venue above water would also allow the county to keep up with population increases and provide as many boating opportunities as possible in Marina del Rey. The boat storage structure would be 6 levels and 70 feet high, according to most recent plans. The project also proposed to feature on-site parking for 134 vehicles, plus 20 mast-up storage spaces, a 3,070-square-foot and 2-story building, waterside queuing docks and public promenade. The county also aimed to make accommodations for charter boat services, moving the loading dock from Boat Central’s parcel to Parcel 55. Don Geisinger, a lease specialist with Los Angeles County’s Department of Beaches and Harbors said the Boat Central project originally started as a commercial development proposal in 1999 but became its own project in 2003. The original project was approved to advance second-generation development for Marina del Rey. “We’re going to expand the operations for many people who have been unable to find places to conduct their charter businesses,” Geisinger said. Every speaker and group who addressed the Small Craft Harbor Commission expressed opposition to the Boat Central proposal. Tim Riley, Marina del Rey Lessees Association, said a lot has changed at the county waterfront enclave since the project was approved 13 years ago. Riley also questioned Boat Central’s economic viability. He also said Parcel 52 should not be restricted to boating activities but instead be open to visitor-serving uses. Marina Boat Owners Association President Andy Bessette said Boat Central would block safe access to a boat launch ramp. Other speakers warned commissioners the Boat Central project would negatively affect recreational boating activities in Marina del Rey by making it too expensive for the everyday boater to be on the water. One commissioner said the intent of Boat Central was for boaters to have more affordable alternative to slips. Having a dry-slip storage structure where boaters would pay more for a space than a slip in one of the local marinas would defeat the purpose of building Boat Central, it was pointed out. The developer, answering questions whether Boat Central would be abandoned during construction, told commissioners the project would have a “completion guarantee,” which comes with a bond. Boat Central was already vetted out and approved by the California Coastal Commission in 2015. An automated dry boat storage stack currently exists at Port Condominium and Marina in Fort Lauderdale, Florida. The 125-slip dry boat storage is fully computerized and is operated by a touch screen display. Its crane lifting system is laser-guided and can carry any sized vessel up to 35,000 pounds.